My biological alarm clock, after 28 years, is finally blasting me awake (to the sound of Renée Montagne’s voice, of course). I am all ’bout the babies lately: the ones running around in the park, the ones being pushed in strollers by their hot dads, but never ever the ones crying in the middle of a tennis match. I’ve even started eyeing kids’ clothes! It doesn’t help that great collections abound, including the latest collaboration between Gap and Stella McCartney. A pup in lamb’s clothing: This second installment (the first one dropped at the end of 2009) speaks to our love for rolled collars, side zip-front jackets, and nautical themes. While it’s nothing revolutionary, it makes us wonder if this is how Stella would design for grown men. (The girls get the usual Stella dose of frills, ruffles, pleats, eyelets, and droopy fabric.) Buy: New Yorkers have been chipping away at inventory for the past five days (via the Gap White Space pop-up). Now the rest of us can follow. Click here. TSF’s excited for Loup, the tennis clothing line that got a write-up over at DailyCandy this week (and that usually means a kiss of life — is that the antonym? — for anything trying to make it big with the ladies these days). Flashback: TSF’s Nick McCarvel chatted with Loup owner Danielle Ribner back in September. The 2010 spring men’s collection from Balmain has taken our love for the military motif to the next level with an homage to the air force. They throw in a few other looks — motorcycle jackets, graphic tees (tigers! ), requisite skinny pants, and some softer sweatshirts — to round out the rugged season. View: The lookbook is available here; and you can pick up some of the goods here. sunday survey: who are your picks to win in key biscayne? We all know who Anna Wintour (yes, wearing sunglasses during the evening session) and Mirka are rooting for to win in Florida. But who are your picks? Let us know in the comments section. It hasn’t been an easy year for Melanie Oudin. Since she rocketed to stardom at last year’s U.S. Open, the American teenager has struggled to marry her new-found life in the public eye with hard work off the tennis court. The result has been a topsy turvy tennis season that has left most of us wondering: What will happen to Melanie Oudin? What most of us (including myself) have forgotten, is that before there was her run at Flushing Meadows or her stunning breakthrough at Wimbledon, she has spring success in North America last season with inspiring tennis at Charleston, Indian Harbour Beach (ITF) and Raleigh (ITF). It was a span of four weeks of tennis that saw Oudin lose just one out of 15 matches, sending her ranking from 177 in the world to number 125. What we’ve learned about Oudin in the nine months that we’ve known her well (since she won six matches at Wimbledon last summer), is that she’s a streaky player. After her spring winning streak last year, she lost badly at the French Open the first round of qualifying, winning just one game in a match against Zuzana Ondraskova, ranked 192nd. amer’s twit pic: is that him? 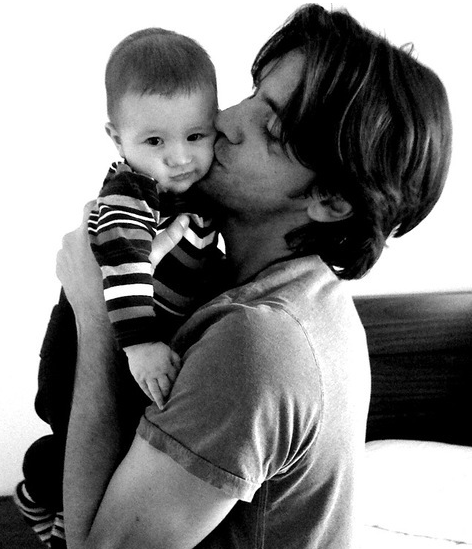 We’re absolutely gaga over this adorable picture from Amer Delic‘s Twitter profile. But we’re wondering: is that really him? And if not, who the heck is it?! What a freakishly cute baby, too! In the past few weeks, Real Housewife Kelly Bensimon has made a push to become the most tennis-savvy of the New York ladies, first appearing with Venus at the Billie Jean King Cup in New York, and yesterday hosting a celebrity exhibition match in Miami. TSF spoke with Kelly’s cast mates Ramona Singer and Jill Zarin at the Night of Legends tennis event in September. We wondered who Jill might pick as a doubles partner in a re-match of the two reality stars’ tennis duel. Maybe she should consider Kelly, no? The ladies of the Real Housewives of New York are back on the small screen with their third season of cat fights and caviar. short balls: paris says au revior to the french? 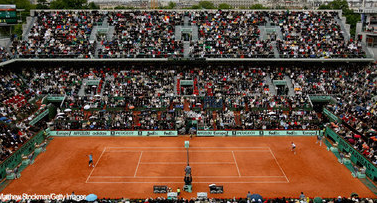 Once little-confirmed rumors have reached the top of tennis’s tier, as this week the tournament director for the French Open said that there is a good chance that the tournament might say good bye to its current grounds inside the Paris city limits because of future growth plans. A bigger tourney means a new place? We’re not sure if we like that. Tennis. It’s healthy. The USPTA, the professional organization of tennis teaching pros, announced a re-design of tennis-health.com. Though the layout doesn’t threaten the design of today’s top pro’s sites, we’ve gotta hand it to the folks at the USPTA for their continued commitment to health and tennis. Forgot tennis was a lifelong sport? Shame on you! Partytown, USA. We’re sad to be missing a barrage of parties this week in Miami that are happening in line with the Sony Ericsson Open. FILA‘s Friday Night bash will be most missed on our calendar, along with their fashion show on Saturday. There’s two mixology sessions that have our mouths watering. Best we get to Miami for some fashion and drinks (and yes, some tennis! ), next year. So Long, Butch. The founder of what is known today as the Sony Ericsson Open, Butch Bucholz, is retiring from his position as chairman of the event after nearly three decades with the event, which many called tennis’s “Fifth Major”. Missing Serena? Venus is there. Venus Williams will be the lone sister in Miami competing for the family. She takes a ten-match win streak into the tournament. Her last loss came to Li Na at the Australian Open. 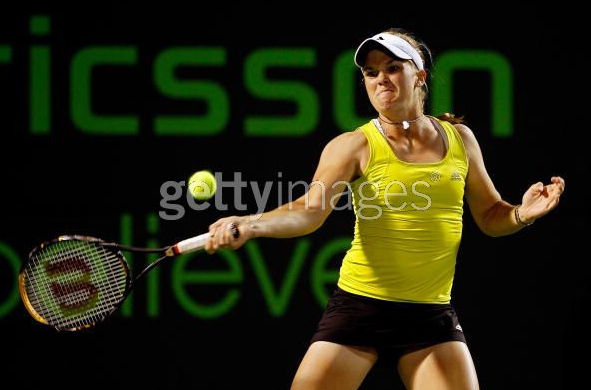 What do you think of Jelena Jankovic and Ivan Ljubicic winning at Indian Wells? How does it bode for the rest of their year? Can Jankovic finally win a Major? And will Ljubicic ever re-enter the Top 10? Become a threat again? Tell us what you think. Judging by the pics we saw via Refinery29 of photographer Ryan McGinley‘s latest exhibit, we’re all about his refreshing move away from landscapes and towards raw portraits. Visit: “Everybody Knows This Is Nowhere”, Team Gallery, New York City; through April 17, 2010. Note a few deets: first up is that stripe that breaks up the collar of his All Court polo; also note the horizontal contrast line that runs along the placket of the shirt. His black Vapors are pretty darn shiny and have an “RF” monogram on the heel. TSF saw a pair of these on site (worn by a spectator) and it’s very reminiscent of his Darth Federer from the 2007 U.S. Open. And in case you’re keeping track, he’s traded his diaper bag from the Australian Open with this more demure gym bag. Buy: Nike Lunarlite Vapor Tour, $120; Spring All Court Polo; $80. Moral support: Gwen Stefani and Gavin Rossdale were on hand to watch their besty Roger Federer — top seed at this week’s BNP Paribas Open in Indian Wells, Calif. — lose to 27th-seed Marcos Baghdatis 5-7, 7-5, 7-6 (4). Roger had a match point in that twelfth game of the third set but couldn’t convert. TSF was on hand to watch Marcos smoke Arnaud Clement 7-6 (7), 6-1 in the second round and he’s playing pretty well this week. 14th seed Kim Clijsters became the latest high seed casualty at the 2010 BNP Paribas Open when she fell to 23rd seed (and head-jerker) Alisa Kleybanova 6-4, 1-6, 7-6 (7-4). Up next for the Russian is Spaniard Carla Suarez Navarro, who took out top seed Sveta Kuznetsova in the round prior. “What got me to be ahead was I was playing aggressive tennis and being dominant,” Clijsters said about her performance, which saw her get back into the match by winning the second set but losing a 4-0 lead in the third. “[Kleybanova] put me under pressure during those long rallies and I kind of just backed off a little bit.” Clearly her rust from not having played competitively since the Australian Open (save for two matches at the Billie Jean King Cup earlier this month) was showing. Buy: Fila Signature Quilt Bowler, available in white, black, chinese red, and gold, $49.99, at buy.com. And her outfit: Center Court Sleeve Top, in ebony/white and white/hot coral, $48; Wrap Skort, ebony/white/hot coral, $45; Jacket, $68.